He is an ancient mariner, with a long grey beard, a glittering eye and a skinny hand, who tells a story of tragedy and horror and prayer and redemption at sea. The story was related in Samuel Coleridge’s poem THE RIME OF THE ANCIENT MARINER. In ALBATROSS, the Mariner himself tells the story more fully (including the backstory – how he came to sail on the ship), and notes that although he told Coleridge the story himself, in the poem the rendition is too pretty. The Mariner’s story is raw, with many details, he says, that were left out of Coleridge’s poem. ALBATROSS was written by Matthew Spangler and Benjamin Evett, and directed by Rick Lombardo. 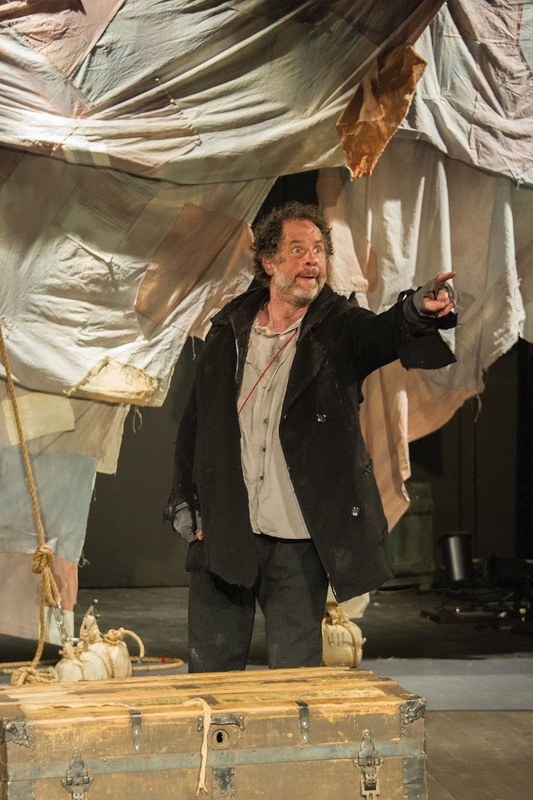 Benjamin Evett portrays the Mariner in a fine solo performance at the 59E59 theater. This is a rich rendition of a powerful story with many disparate elements. The performance is mesmerizing and Evett’s Mariner – like the Mariner in the poem – grabs the audience and holds them through the hour and a half (no intermission) the story unfolds. Many things happen; the performance tells the story clearly and actively, assisted by sea-faring props, scenery and costuming. Evett arrives on stage in character, and tells the story entirely in character. The play, produced and created at the “Poets Theater” in Boston, acts not only as a powerful theatrical experience, but also as a critical commentary on Coleridge’s poetry. Many famous lines from the poem are quoted, some details are slightly altered, and much more, consistent with the story, is added. Literally, the poem's title means "The icy crust of the ancient mariner." ALBATROSS is a rich theatrical experience, with a terrific performance, some humor, an opportunity to experience life on a marauding ship several hundred years ago, and a chance to gain insights into a poetic classic. The 59E59 theater is a comfortable, busy place, hosting several plays in multiple theater spaces, and featuring a well-stocked bar which is open before and after shows and can be accessed even without a theater ticket. In this complete text, for ease of easy reading, each of the characters who speaks is rendered in a unique font style, and whenever time passes or there is a change of scene between lines, there is a separation of the text. giving life to the poetry. Now wherefore stopp'st thou me? 'There was a ship,' quoth he. Out of the sea came he! And southward aye we fled. The helmsman steered us through! Came to the mariner's hollo! 'God save thee, ancient Mariner! That made the breeze to blow! The silence of the sea! The very deep did rot: O Christ! That ever this should be! Had I from old and young! A weary time! a weary time! A speck, a mist, a shape, I wist! Through utter drought all dumb we stood! And cried, A sail! a sail! And all at once their breath drew in. See! see! (I cried) she tacks no more! She steadies with upright keel! The day was well nigh done! They fled to bliss or woe! Like the whizz of my cross-bow! 'I fear thee, ancient Mariner! I fear thy skinny hand! Fear not, fear not, thou Wedding-Guest! Alone on a wide wide sea! The many men, so beautiful! Lived on; and so did I. Is the curse in a dead man's eye! Beloved from pole to pole! To Mary Queen the praise be given! To and fro they were hurried about! Yet now the ship moved on! 'Is it he?' quoth one, 'Is this the man? What makes that ship drive on so fast? Fly, brother, fly! more high, more high! The light-house top I see? Is this the hill? is this the kirk? Is this mine own countree? O let me be awake, my God! So smoothly it was strewn! Oh, Christ! what saw I there! And, by the holy rood! It was a heavenly sight! It is the Hermit good! How loudly his sweet voice he rears! 'Why, this is strange, I trow! 'And they answered not our cheer! How thin they are and sere! I stood on the firm land! What loud uproar bursts from that door! Which biddeth me to prayer! Scarce seemed there to be. And youths and maidens gay!